Marine Corps/Cpl. Jon SosnerA US Marine Corps CH-53E Super Stallion preparing to take off aboard the amphibious assault ship Iwo Jima while transiting the Bab al Mandab Strait on June 7. The US Navy says it hasn’t had an unsafe interaction at sea with Iran in more than a year. During that period, however, Iranian drones have become more active over the Persian Gulf, worrying the Navy. Iran’s drones are just one asset the country could use to challenge freedom of movement in the Gulf. It’s been more than a year since US Navy ships in the Persian Gulf have had what they call unsafe or unprofessional interactions with Iranian vessels, but Iran has found a new way to keep tabs on US warships in one of the world’s most heavily trafficked sea corridors. According to the Navy, Iranian unmanned aerial vehicles are increasingly active over the gulf, operating in what officials have described as unsafe ways. Marine Corps and Navy officials said US ships in the Persian Gulf were regularly overflown by Iranian unmanned aerial vehicles, USNI News reported earlier this week. Lt. Chloe Morgan, a US Naval Forces Central Command spokeswoman, told Business Insider on Thursday that the most recent unsafe or unprofessional encounter between the US and Iran at sea took place August 14, 2017. In that incident, a drone without any navigation lights flew close to aircraft conducting night-landing operations on the American aircraft carrier Nimitz. Before that, on August 8, 2017, an Iranian drone flew close to fixed-wing aircraft conducting flight operations, causing an F/A-18E Super Hornet to manoeuvre to avoid a collision, Morgan said. Marine Corps/Gunnery Sgt. 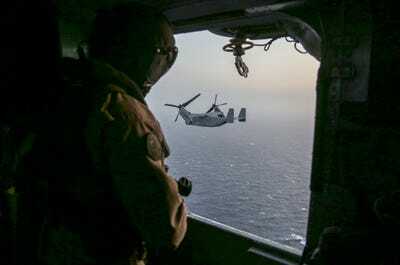 Eric L. Alabiso IIAn MV-22B Osprey, seen from the observer window of a CH-53E Super Stallion, flying over the 5th fleet area of operations on June 10. While no unsafe interactions have been reported since, the Navy is still on guard. “Even with decreased incidents, we remain concerned with the increased number of Iranian UAVs operating in international airspace at night without navigation lights or an active transponder as would be expected according to international norms,” Morgan said. The Navy has also been absent from the Persian Gulf for extended periods this year. “We did go to the Persian Gulf. We got the normal welcome from the Iranians, UAVs overflights, exactly as we trained for; no surprises there,” Capt. 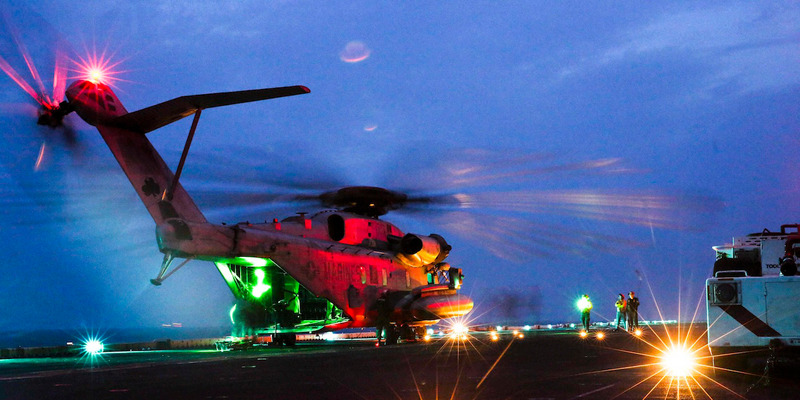 Jack Killman, the commander of Amphibious Squadron 4, said at a conference on Tuesday. 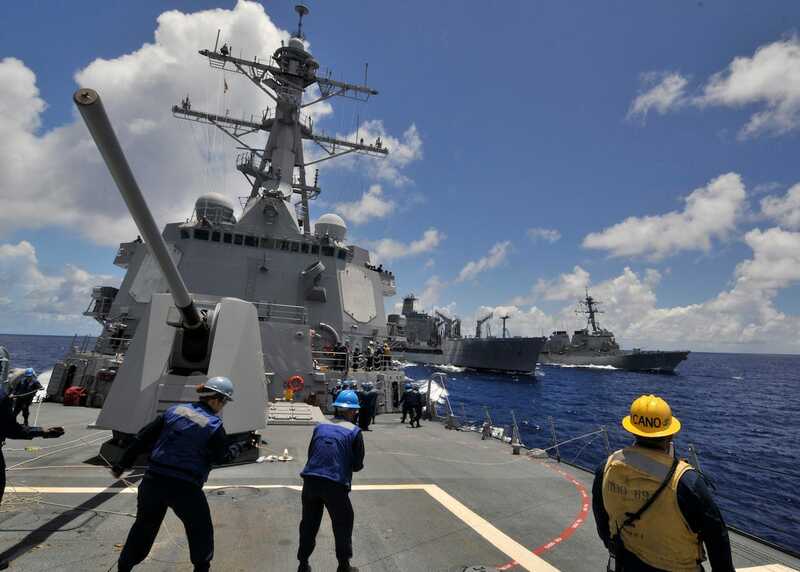 Two Arleigh Burke-class destroyers were also operating in the area, while the Iwo Jima was in the gulf, according to USNI News. Those destroyers, which are outfitted with powerful air search radars, can detect and identify approaching drones and boats. Picking up smaller drones and figuring out whether they are a threat is harder, Killman said. “The small boats” and “the UAVs are definitely out there tracking us,” he said. US NavyThe Arleigh Burke-class guided-missile destroyer Mustin after a refuelling at sea in 2009. Small boats and drones are just two components of the layers of asymmetric defences that Iran has deployed to the Gulf region, particularly to the area around the Strait of Hormuz, a narrow channel in the Persian Gulf through which roughly 30% of world’s oil is shipped. Iran has also made profligate use of sea mines, which pose a unique and hard-to-counter threat to the Navy, and it recently boasted of increasing the range of its land-to-sea ballistic missiles, enabling them to strike “any vessel or ship” out to 435 miles. The US also takes the layered-defence approach, of which the destroyers are a big part. Though the Navy’s capacity to keep all the needed parts of that defence in place at the same time may be an issue, Killman said. Iranian drones’ increasing presence above and around US ships hasn’t changed the way the Navy operates, Morgan, the Naval Forces Central Command spokeswoman, said on Thursday. “The United States Navy has not adjusted its operations and will continue to operate wherever international law allows,” Morgan told Business Insider, adding that the service continued to work to ensure freedom of navigation and free flow of shipping in international waters. “The US Navy continues to remain vigilant, and our commanding officers retain the inherent right to act in self-defence,” Morgan added.